Citation Information: J Clin Invest. 2017;127(6):2277-2294. https://doi.org/10.1172/JCI89950. It has been postulated that during human fetal development, all cells of the lung epithelium derive from embryonic, endodermal, NK2 homeobox 1–expressing (NKX2-1+) precursor cells. However, this hypothesis has not been formally tested owing to an inability to purify or track these progenitors for detailed characterization. 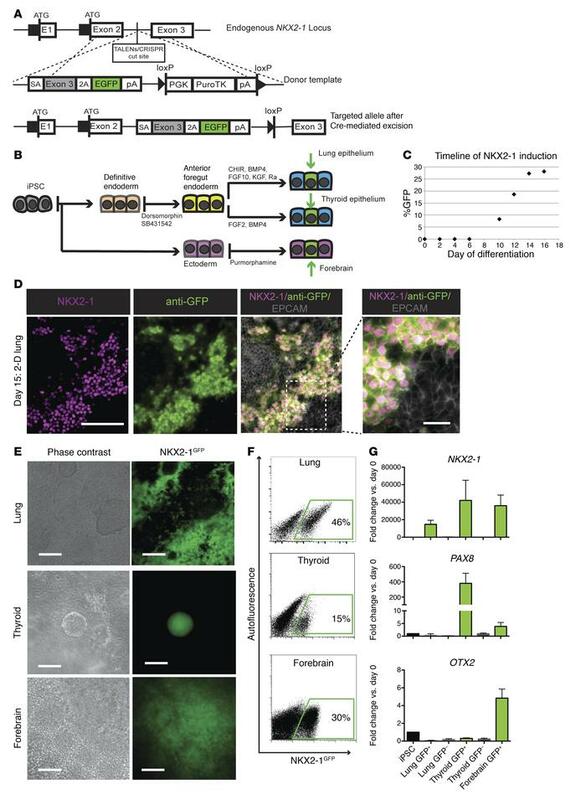 Here we have engineered and developmentally differentiated NKX2-1GFP reporter pluripotent stem cells (PSCs) in vitro to generate and isolate human primordial lung progenitors that express NKX2-1 but are initially devoid of differentiated lung lineage markers. After sorting to purity, these primordial lung progenitors exhibited lung epithelial maturation. In the absence of mesenchymal coculture support, this NKX2-1+ population was able to generate epithelial-only spheroids in defined 3D cultures. Alternatively, when recombined with fetal mouse lung mesenchyme, the cells recapitulated epithelial-mesenchymal developing lung interactions. We imaged these progenitors in real time and performed time-series global transcriptomic profiling and single-cell RNA sequencing as they moved through the earliest moments of lung lineage specification. The profiles indicated that evolutionarily conserved, stage-dependent gene signatures of early lung development are expressed in primordial human lung progenitors and revealed a CD47hiCD26lo cell surface phenotype that allows their prospective isolation from untargeted, patient-specific PSCs for further in vitro differentiation and future applications in regenerative medicine. Purification of human NKX2-1+ lineages derived from ESCs/iPSCs using NKX2-1GFP reporters. (A) Gene editing strategy based on TALENs or CRISPR technology to target a GFP reporter to the human NKX2-1 locus to engineer NKX2-1GFP iPSC/ESC lines. See also Supplemental Figure 1. (B) Schematic overview of in vitro directed differentiation of ESCs/iPSCs into NKX2-1+ lineages: endodermal lung or thyroid epithelia versus ectodermal forebrain. (C) Representative timeline of GFP expression measured by flow cytometry during lung-directed differentiation (C17). (D) Immunostaining of day 15 lung-directed differentiation for NKX2-1, GFP (anti-GFP), and EPCAM. Scale bar (left panels): 100 μm. Right panel is a zoom in (white dashed-line box). Scale bar: 25 μm (C17). (E) Phase contrast and fluorescence microscopy of C17 iPSC-derived cells generated in the lung (day 15), thyroid (day 27), and forebrain (day 10) protocols. See also Supplemental Figure 2. (F) Flow cytometric analysis of lung (day 15), thyroid (day 17), and forebrain (day 14) protocols (C17). (G) Fold change, compared with day 0, of mRNA expression of sorted NKX2-1GFP+ and NKX2-1GFP– cells from those time points by RT-qPCR; quantified as 2(–ΔΔCT), n = 3 (C17).